Beer workers have been around for thousands of years, long before the pyramids of Egypt were built. Indeed, it wouldn't be surprising to find out that the very idea of a pyramid was invented by people sitting around a few earthen jugs of beer, trying to outdo each other's ideas for a burial plot for the latest dead pharaoh. Prior to the U.S. Civil War, beer making throughout North America was composed mainly of small local breweries, nearly 4000 in the U.S. alone. In the 1870's, the industry began to consolidated into large, capital-intensive operations employing dozens and sometimes hundreds of workers. Typical big business behaviour of the time - treating the workers like dirt - led to widespread worker dissatisfaction and the formation of unions. Beer workers' products have always been popular. The workers themselves, however, have not always been treated with the respect and economic consideration they earned. Their knowledge, skills, experience and sheer physical strength were often unfairly exploited by their employers. Only a little over a century ago, for example, many beer industry workers were required to live right in the brewery. This was so they would be available around the clock and their lives closely controlled, almost like farm animals. In the 1870's beer industry workers began to talk union. Other trades had organized. Printers, carpenters, masons and coopers (barrel makers), among many others, were learning how to speak with one voice to employers and governments. Beer workers followed their lead and began to organize and confront their employers. At a time when no law in North America legally protected union activity, it took courage to join a union and even more courage to actively promote it. We owe these brave pioneers a lot. Many lost their jobs because they supported the union. In early brewery strikes, the employer would respond by hiring strikebreakers ("scabs") to do their jobs. Often, an employer would pay the scabs more than the union had demanded before going on strike. Coopers were the workers who made the beer barrels. It was a skilled occupation. Early coopers shaped their staves with broadaxes, planes, and drawknives, then gathered them in a circle secured by a ring. The gathered staves were heated over a small stove or cresset to make them pliant and were then bent to shape. Hickory hoops held them for banding. The trickiest step was cutting grooves inside the lips to fit the barrelheads tightly. Freedom to live anywhere instead of being confined to the factory. A 10-hour day, 6-day week, a great achievement for its time. FREE BEER. Just how much free beer each worker received is not recorded. In 1888, with the help of a city-wide boycott, the infant brewery workers' union won a nine-month strike in San Francisco over the firing of union workers and the use of scabs. The great success of the strike led to many others by the militant young union that would eventually be called the International Union of United Brewery, Flour, Cereal, Soft Drink and Distillery Workers of America (BFCSD). In 1889, the U.S. Brewers' Association caved in to reality and recognized the union as the legitimate representative of American beer workers. Organizing drives continued to be resisted and scabs were still often hired during strikes and lockouts. Still the union prospered and helped inspire the formation of other unions. Among the other unions born in the wake of the Brewery Workers were the Retail Clerks International Protective Association (1890) and the Amalgamated Meat Cutters and Butcher Workmen of North America (1897). These unions would eventually merge (1979) to form the giant United Food and Commercial Workers International Union, now 1.4 million members strong, 230,000 of whom belong to UFCW Canada. The ancestor of the beer truck. 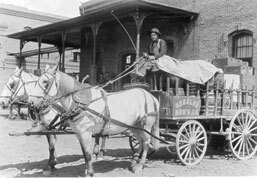 Beer was precious cargo and the arrival of the horse-drawn beer wagon was a big event in many a small town in the 19th century. In the late 19th century, however, "temperance" organizations opposed to alcohol sometimes greeted the wagons with protests. Canadian brewery industry workers first organized in Toronto in 1902. It is not known if the IBW started the movement, but the U.S. union quickly spread into Canada, using its strength and experience to help Canadian brewery workers improve their working lives. n 1905, Canadian brewery workers traveled to Chicago for the founding convention of the International Workers of the World, which sought to unite all workers into "One Big Union". The idea ultimately failed for a number of reasons, including U.S. government repression, but the Canadians' presence in Chicago shows that the young union was as militant in Canada as it was in the U.S.
During the first half of the 20th century, the union focused on organizing breweries across Canada, with great success. After World War II, the union turned its attention to organizing the retail and wholesale sides of the beer industry. The victory touched off a wave of organizing and within a year nearly a hundred breweries were organized. In 1889, the National Brewers' Association recognized the union. In 1948, the BFCSD started signing up these workers, beginning with the warehouses and the drivers who operated out of them. The stores were quick to follow. All the workers in a particular region belonged to their own local union. By the late-1950s, most Brewers' Warehouse and Retail workers belonged to one of more than a dozen BFCSD locals, each one established specifically to represent that region's warehouse and retail workers. In the 1960's it became clear to the locals that it made sense to negotiate the collective agreement as one large unit instead of many small ones. First of all: it made sense to have uniform conditions throughout the company. The work is exactly the same, everywhere in the province. Secondly, a single contract covering all workers would avoid having a small or weak local make a deal that would undercut the bargaining power of the larger locals. Thirdly, if a strike were ever necessary, it would only be successful if it were a province-wide strike. A single bargaining unit gave the union a lot more power. Out of this analysis came the United Brewers' Warehousing Workers Provincial Board, an Ontario-wide organization to which all the locals belonged. Think of the locals as cities and towns and the UBWW as the province. In 1905, Canadian brewery workers attended the founding convention of the Industrial Workers of the World. The first unions in Canadian breweries were formed in 1902 in Toronto. In 1972, the union went through a crisis. In the U.S., the BFCSD had been shrinking. For years, the Teamsters had been successfully raiding BFCSD breweries, taking members away from the union. As well, the Teamsters were having more success organizing non-union breweries. Rather than keep fighting the Teamsters, the BFCSD leaders decided to join them. A merger was scheduled for approval at that year's International Convention in Cincinnati, Ohio. In Canada, there was great opposition to the Teamsters' merger. Union activists fanned out across Ontario, getting members to sign petitions opposing the merger. Among the Brewers' locals, all but three went to the convention to vote against joining the Teamsters. When the vote to merge succeeded because of strong U.S. support, the Canadian locals walked out of the convention, returned to Canada, and established the Canadian Union of Brewery, Flour, Cereal, Soft Drink & Distillery Workers – the Canadian Brewery Workers, for short, since most members were in the beer industry. At the time of the breakaway, the union had about 16,000 members across Canada, most of them in Ontario, Quebec and British Columbia. 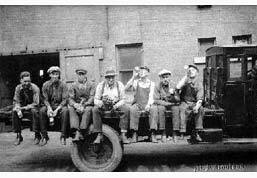 Workers in the oldest brewery in northern Ontario take a break. The Soo Falls Brewing Co. in Sault Ste. 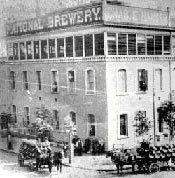 Marie opened in 1900 and eventually became the employee-owned Northern Breweries Ltd. This picture was taken in 1927, the year that the first Brewers' Retail store opened in Ontario. In the decade that followed, the Canadian Brewery Workers had many ups and downs. The "ups" were a series of excellent contracts that made beer industry workers among the best paid in Canada. The "downs" were a string of raids and fragmentation that saw the union's numbers decline. By the mid-1980's, it was clear to the union's leadership that it had to merge with a larger union in order to survive. This was especially urgent for the Brewers' Retail workers. In 1985, the new Ontario Liberal government had promised to start selling beer in small grocery stores (as happens in Quebec). This would have wiped out thousands of union jobs in the beer stores. The union also knew it would only be a matter of time before sales extended to supermarkets (as in most U.S. states), wiping out the remaining beer store jobs. After much internal debate and two conventions, the Canadian Brewery Workers voted to merge with the United Food and Commercial Workers (UFCW) in 1986. Some locals went their separate way to other unions but all the Brewers' Warehouse and Retail locals stuck together in joining UFCW. The main reasons were the UFCW's accommodating structure and the fact that it too was a retail-based union, though much larger. UFCW Canada opposed the sale of beer in supermarkets and, with the strong support of the Ontario New Democratic Party, helped kill the idea of corner store and supermarket beer sales, saving thousands of jobs. In 1948, after having organized virtually every brewery in Canada, the union began signing up the Ontario warehouse and retail store workers of Brewers' Retail, including truck drivers like this one. In the years following the merger, the UBWW Provincial Board took on even more of its locals' traditional responsibilities, including arbitration, health and safety and education. In early 2003, in an all-member referendum, nearly two-thirds voted to merge all 15 locals representing The Beer Store workers into a single province-wide local of over 6,000 members. The new local was chartered as UFCW Local 12R24. It's unique name is a play on "12 or 24? ", the most common question asked of customers by Beer Store employees. Local 12R24 is proud to carry on the legacy of those first militant beer industry workers of more than 100 years ago. We look forward to making our mark on a new century.